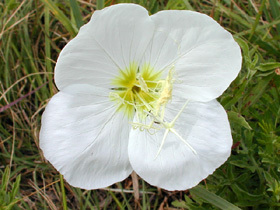 Also Called: White evening primrose. Stems: Erect or sprawling, 1 to several, simple or branched above, densely to sparsely short-hairy. Leaves: Alternate, simple, short-stalked to sessile above, elliptic-lanceolate or oblong-lanceolate; 1 to 4 inches long, .25 to 1 inch wide, short-hairy; margins wavy or slightly toothed, sometimes deeply lobed near base; tips tapering-pointed; upper leaves reduced to linear-lanceolate bracts. Inflorescences: 1-flowered in upper leaf axils. Flowers: Showy, 1.5 to 3.5 inches across; sepals 4, lanceolate, tips united, bent toward 1 side; petals 4, 1 to 1.5 inches long, white, often yellowish at base, fading pinkish; stamens 8, nearly as long as petals; style longer than stamens, stigma with 4 linear lobes, cross-shaped. Fruits: Capsules, narrowly football-shaped, about .5 inch long, 4-ribbed, pubescent; seeds many, small, brown. Habitat: Dry, rocky soils of prairies, roadsides, open woodlands, and hillsides. Distribution: East two thirds of Kansas. Comments: The flowers open in the evening or on overcast days, remain open through the morning but closing during the heat of the day. Hawk moths, hummingbirds, and bees pollinate the flowers.